The links in green are links you guys can go to vote at, and the links in blue are threads we have posted. Voting rewards are being worked on as we speak. 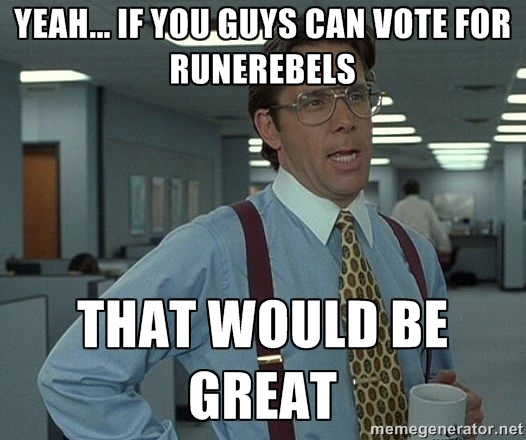 But until then if you guys can vote RuneRebels up, that would be great. Voting rewards are also coming soon but, we in order for us to get up there, vote on EVERY single one of these sites! Want to help us advertise? Post this ad everywhere you can! Already voted. Vote rewards need to be simple, like, 500-1000 coins per vote. Then no new person would vote, and why economy base it? I'd do lamps or something. We talked about having different things, possibly name changes, skill locking, stuff like that. Nothing major that will effect the economy or give anyone a huge advantage in game. Sure, sounds great, but let's be honest not a single new person would vote for this....It doesn't make sense. You guys need to stop planning the rewards around veterans, because we'd vote for nothing as long as we were reminded. We're always open for recommendations. Honestly the only thing I can think of that won't break the economy nor cause that much of an issue are lamps. Or you could have a point shop, and give points for voting, then have multiple rewards which can be bought in a point shop. I just don't see a new player voting for skill locks and name changes....especially when you get done locking skills and changing names...there would be no point for a new player. Look, I know you don't want to provide a unfair advantage. But in order to get votes, you need to provide an advantage to the game. (I realize some people are nice and donate/vote without asking.) But you don't have enough "Veterans" voting per day to get popular, you need the players voting too. Lamps looks like a good idea. No economy breaks and is a good reward. 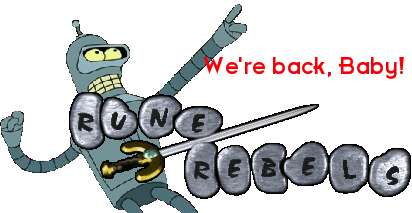 We need some in-game swag like Banners or Tricorne hats or stuff like that! 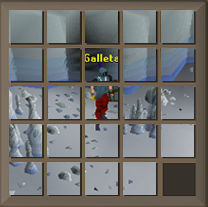 Please don't add anything in game that wasn't there in 06 like "banners" or "hats". I think a mix of forum perks like color changes for names or a badge saying how many times you've voted if that's possible. Maybe some xp lamps in game and have different tiers of lamps like after 2 times of voting on all sites you get the lowest xp lamp after 4 or 5 times of voting you get to a higher xp lamp and maybe a third tier lamp for 10 times of voting. But you can only "cash in" a lamp one at a time so they could either choose to keep getting the tier 1 lamps and cash in every time after 2 times of voting or save up all 10 times and cash in on the biggest xp lamp. (don't know if I'm explaining that right lol) Gold coins is another way to do it. It may not make tons of people vote but it's still an option for those who want it. BTW, voted on all. Can't wait to see RR in the number one spot! Prayer, the idea is noble, but new players are not like you and me. We NEED the new players to vote, you can't just give them forum colors...it will never work. I like tennessee's idea but I don't really understand it completely. I honestly feel like the only logical choice is XP lamps. I don't see new players voting for forum-based rewards............You guys need to think like a new player. Look, I've dealt with advertising and voting many times before on multiple types of private servers. You have to imagine you're a new player who just joined, who has no connection to the server, what's going to encourage me to vote? Being reminded (Auto-messaging in game.) and a reward that I can actually use. Sadly, forum ranks and name changes and skill locks mean almost nothing to a new player.